Blues dance classes take place weekly in Aberdeen at O'Neill's every Sunday. The blues dance classes are hosted by Zoot Swing North and are called the Granite City Blues. If you love blues music you'll love blues dance. Learn to partner dance to awesome blues tunes at the Zoot Swing North blues class from 7pm. Then break into a night of music, dancing and socialising. Blues Dance Classes assumes no knowledge of dancing and you do not need a partner to join, just turn up, meet people, enjoy the music and dancing. It is �5 for the class and the social dance by donation. For Ballroom Latin Dance Classes in Cults or Stonehaven visit our Ballroom Barney page. 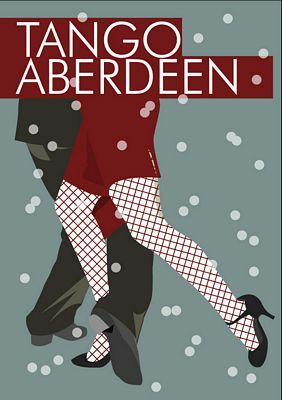 Latin and ballroom dance lessons take place at Aberdeen Beach Ballroom, one of the best venues to be dancing at with a teacher of the highest standard. Contact - Elaine Sim for more information on 01224 823669. New Aberdeen dance classes start soon at Saint Margaret's Church Hall, Gallowgate, Aberdeen. Beginner's class takes place on a Friday evening from 18.30-19.30 and costs �5 per person. 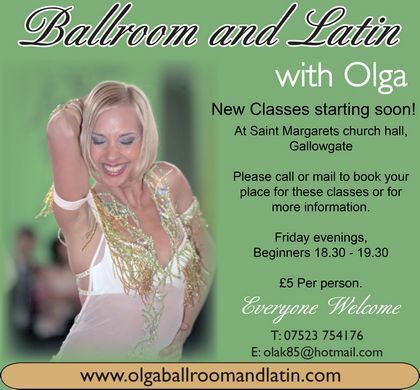 To book your place please visit www.olgaballroomandlatin.com for contact details. Latin Dance Aberdeen provides many opportunities to learn and train in Latin Dance styles in a variation of styles. They run weekly drop in classes, intensive workshops, as well as private tuition in many other Latin dances such as Salsa, Bachata, Kizomba, Samba and Rueda de Casino. The Northern Dance Club meets on Monday evenings 7:30pm to 11pm during Monday 29th August 2011 to Monday 26th March 2012 at Menzies Dyce Hotel, Farburn Terrace, Dyce, Aberdeen. The Northern Dance Club teach Ballroom and Latin American Dancing. Lawrence Dance Academy take place through Aberdeenshire at Cruden Bay, Newburgh, Peterhead, Mintlaw, Inverurie, New Deer and Aberdeen. Dancetoetotoe brings Ballroom, Sequence and Latin American dance classes to the Aberdeen area from Cove and Bridge of Don to Udny Green (near Pitmedden). For more information visit www.dancetoetotoe.co.uk or call call Jean on 01224 481557. 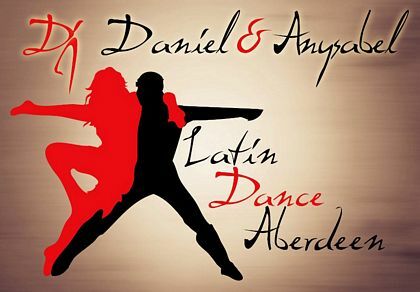 Salsa and Bachata Dancing classes take place every Wednesday night at 8pmat La Tasca, 367 Union Street, Aberdeen. This salsa dance party costs �5 or �4 for the salsa and bachata dancing class and �3 after 9 pm. The salsa and bachata dancing classes start at 8pm with a one hour class taught by Daniel, and followed with salsa and bachata dancing till 11pm.DJ Santy will be taking all requests so bring a USB, MP3 or Ipod if you want. For more information contact santiagohalle@gmail.com, lasalsitadesanty.weebly.com, or on facebook: La Salsita de la Tasca. Culter Village Hall, Peterculter commencing on Friday 8th October 2010. Beginners from 7-8.30pm experienced from 8.30-10pm. Children, Intermediate, advanced classes and private tuition are available. Highland Dancing Classes with C Sinclair School of Dance. Classes are held throughout Aberdeen City and are for all ages. Locations include Craigiebuckler Church Hall on a Saturday and Danscentre, Hutcheon St on a Monday evening. The instructor is BATD registered. Please contact Carolanne on 07972104774 for more information. Salsa Latin Beats can also organise a hen party, corporate event, birthday parties or team building events. 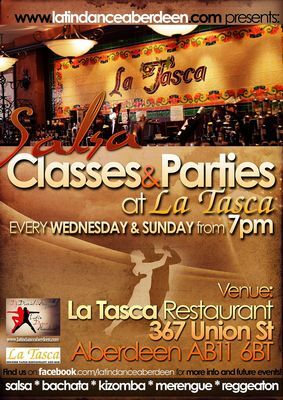 More salsa dance classes take place in La Tasca Taco Restaurant and Bar at 367 Union Street, Aberdeen every Sunday from 8 to 9pm. Lessons include salsa for beginners from only �3-50. La Tasca Taco restaurant has been hosting their weekly salsa party for over ten years. Music is provided by DJ Tonsic - The Latino Machine. La Tasca Taco restaurant is the perfect venue where all the enthusiasts of Salsa, Merengue and other Latin rhythms can have a great evening. The night starts with salsa lesson for beginners, an easy-to-follow approach to the basic steps of Salsa led by a recognised teacher, followed by the second to none new and classic musical selection of host DJ Tonsic, The Latino Machine. It is not just Salsa and Merengue, DJ Tonsic also plays Latin Pop, Reggaeton, Cumbia, Samba, and everything else that evolves from the Latin musical roots. For more info visit: www.latinomachine.co.uk or telephone DJ Tonsic on 07977605493.